During the month of November, many communities in America will honor the contributions of Veterans, military families, and those who gave their lives in service. According to the program, the guest speaker will be Rear Admiral Jesse Wilson. He has served as commander, Naval Surface Force, Atlantic, since July 2014. The force is headquartered at Naval Station Norfolk, in Norfolk, Virginia. Rear Admiral Wilson is the son of a retired Navy Master Chief Petty Officer. 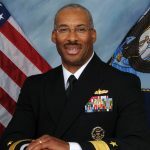 After graduating from the United States Naval Academy in 1986, Wilson Jr. went on to graduate from the Naval War College, where he received a master’s degree in national security and strategic studies. On a major command tour, Wilson served as sea combat commander for a Carrier Strike Group, and while in command of a Destroyer Squadron he led the U.S. Pacific Fleet’s annual humanitarian and civil assistance mission to Southeast Asia and Oceania. Wilson has served as an interim deputy director of the 21st-Century Sailor Office. Thursday’s Veterans Day Program at Norfolk State University will feature the Army Reserve Officers’ Training Corps/Naval Reserve Officers Training Corps Joint Color Guard and the Norfolk State University Jazz Ensemble. The opening remarks will be given by Dr. Melvin T. Stith, interim president, Norfolk State University and a history of Veterans Day will be presented by CDT Jason Addison of the Norfolk State Army Reserve Officers’ Training Corp.
Midshipman First Class Victoria Estrada will introduce the guest speaker, and the closing remarks will be made by Wayne L. Ivey, director of Military Services and Veterans Affairs. “We’re involved in making sure that the classes that they sign up for are a part of their program. We ensure that they remain on track for graduation,” Ivey said in a May news release announcing Norfolk State’s 2018-19 designation as a military friendly school. Norfolk State University scored at least 16 percent above standard ratings in six categories: academic policies and compliance, admissions and orientations, culture and commitment, financial aid and assistance, graduation and career and military student support and retention. The category the historically black college most excelled in was admission and orientation, at 82 percent above standard. “We offer any type of counseling they need. We also make the tutoring services available to them. We do all those things for the veterans to ensure they’re successful while they’re here at Norfolk State,” Ivey said. The Veterans Day Program will be held Thursday, November 8, 2018, at the Student Center. RSVP is required.